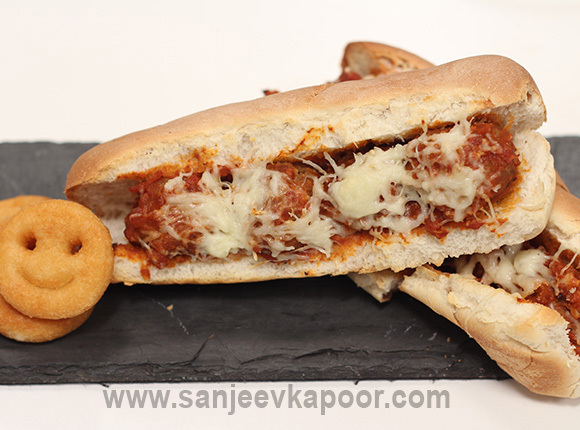 Mutton mince balls cooked in spicy tomato puree, stuffed into slit hot dog buns, topped with mozzarella cheese and gratinated. Mix together mutton mince, 1 tablespoon garlic, mustard paste, salt, 1 teaspoon chilli flakes, crushed peppercorns, 1 tablespoon parmesan powder and breadcrumbs in a bowl. Add egg and mix well. Set aside for 10 minutes. Divide the mutton mixture into 16 equal portions and shape them into balls. Heat 1 tablespoon olive oil in a non-stick pan. Place the meatballs in it and cook till half done. Heat remaining olive oil in another non-stick wok. Add onion and remaining garlic and sauté for ½ minute. Add tomato puree and mix well, cook on low heat for 5-10 minutes. Add meat balls, basil leaves, salt, crushed peppercorns, remaining chilli flakes and 1 tablespoon parmesan cheese powder and mix well. Cook till the meatballs are fully done and gravy thickens. Remove from heat and set aside. Slit the hot dog buns horizontally and stuff with 4 meat balls along with the gravy into each. Sprinkle mozzarella cheese and place them on a baking tray. Place the tray in the preheated oven and bake till the cheese melts.